Noam Chomsky, a leading American academic who has been at the forefront of anti-war protests since the 1960s, says the Bush administration is wrong to stress military options in its dealings with Iraq. You never need an argument against the use of violence, you need an argument for it. And the arguments that have been given for it are not convincing. There is no debate about the importance of disarming Iraq and indeed other countries that have the capacity to use weapons of mass destruction. That is very important and everyone agrees on it. The way to proceed with that is the way that has been done - with careful inspection procedures and efforts to ensure that the US and Britain and others will no longer carry out the policies of the past and provide Saddam with means for developing weapons of mass destruction. It is extremely unlikely that Saddam Hussein would use nuclear weapons, which is a recipe for instant suicide - except in a desperate reaction to an attack. So we should certainly do everything to prevent him from developing weapons of mass destruction. I think that nobody doubts that the world would be better off if he is eliminated. But the means that are proposed are outlandish. The means that are proposed are that we should carry out an attack which we understand may cause very severe humanitarian catastrophe and might also lead to the only real likelihood of his using weapons of mass destruction. There is simply no historical precedent in the history of the United States or of Europe for such overwhelming opposition to a war at this stage - that is before it has even been undertaken. The US planners are well aware that it is not a situation like the 1960s, when you can carry out aggression and violence for years with no public opposition. Now the popular consciousness has just changed. You can declare victory over the much weaker enemy - but anything longer than that is going to arouse the public which simply is not as willing to accept aggression and violence as Europe and the United States have been in the past. Whether there will be large-scale humanitarian catastrophes, nobody knows. It is a reasonable possibility and sane people do not undertake actions when they know that there is reasonable possibility that it may lead to a humanitarian catastrophe unless they have enormously powerful arguments. The arguments that they have put forward are so weak that there can be no choice about this. American academic Noam Chomsky rose to prominence for opposing the Vietnam War and has criticised successive White House administrations. Professor Chomsky, whose protests over the years are well known to Bostonians, acknowledges the brutality and violence of the Iraqi regime, but seems to think it will disappear of its own accord. A bully is a bully whether he (or she) is in a schoolyard or running Iraq. Bullies back down when faced with force. It is fear, not appeals to reason, that cause them to cease and desist their behaviours. The international community must be prepared to use force (and use it, if necessary) if Iraq is to be forced to give up its weapons of mass destruction. Noam Chomsky speaks an awful lot of sense. If such an ardent warhorse as Winston Churchill said: "Jaw, jaw is better than war, war," then shouldn't we be more supportive of the non-violent options for this debacle? Would Tony Blair like his son to be one of the British troops in the frontline? I really doubt it. This argument isn't about the defence of the Western democracies, Iraq can't do serious damage to us. That and the lack of human rights in Iraq is a poor excuse for a war of any scale. Haven't the Iraqi people suffered enough in the past 12 years? Mr Chomsky is admirable in his desire for peace and love throughout the world. It is a lovely dream, but we must live in the real world. In the real world the leaders of countries like Iraq and North Korea are dangerous to their neighbours' very survival. Something must be done proactively. Peace at any cost is nothing but surrender. I would dispute the contention of Mr Chomsky, as well as the French and Russians, that inspections will solve the problem in Iraq. Iraq could end all the tension at any time by simply surrendering the weapons it agreed to at the end of the Gulf War over a decade ago. They have not and they will not. War will surely follow. 1. Under what circumstances would Dr Chomsky support force? It is always possible to say that we need more time, information, debate. Short of a physical attack on the United States, eg, Japan and World War II, would he ever agree that a time had come when force was the only option left? 2. I recall that there was significant opposition to the United States entering what became WWII before Pearl Harbour. So the current protest is not unprecedented. I respect Noam Chomsky's opinions and I think that he is right in many cases. However, I think that the Baathist party in Iraq is clearly a serious threat to the United States as well as Iraq's neighbours. Saddam Hussein is a ticking time bomb. He needs to be eliminated before he destabilises the whole region. If it requires military action to do it, let's do our best to prevent the civilian casualties and get Saddam out of power. No war is good. However, the alternative to a war with Iraq would be to maintain a permanent force to ensure that the "dual use" facilities are never used to make weapons of mass destruction. Do you feel that maintaining a permanent occupying force in the Middle East is sane? Chomsky doesn't know if Saddam Hussein will use nuclear weapons or not. His "extreme" doubt is simply his opinion. Furthermore, Chomsky assumes (irrationally) that Saddam will choose rational decisions. Who knows what value Saddam places on his own life, or the life of his people? Action is being taken at last to remove a dangerous man from power, at last. Good job President Bush! Once again, Chomsky cuts through to the truth of the matter. It up to Bush and Blair to convince us that violence is necessary. Neither has done so. War is not an option, it's a failure. With the anti-war voice getting louder these days it's important to realise that no one wants war. However, it also important to remember that there are outcomes that could be worse than war, although it may seem hard to believe. Are there still people who feel that Iraq has not had sufficient chances to heed the UN? If so, I would like to hear how much longer we should give Saddam. People forget that he can end this entire situation by agreeing to stop playing games with the UN. I agree with Mr Chomsky. In addition, I believe that the so-called reason for war - to prevent the proliferation of terrorism - will achieve its opposite. Such a war will create regional hatred for the "West", and inspire more people to commit terrorist acts. This in turn will require further military actions. The intended winners are obviously the military complex, the armaments corporations, and the western oil corporations. Everyone else will lose. 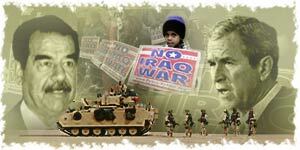 War with Iraq is insane with the reasons given. More and more it is evident that the situation with Iraq is used to direct the focus of US citizens away from the commitment of the current administration to degrade other laws and policies ie environmental, human rights, individual freedoms, economic and others. It seems that a blanket of fear is pulled over the eyes of the people and anything goes in the name of national security, patriotism and support of a "war time" president. As if leaving Saddam Hussein in power is not a perpetual humanitarian catastrophe. Since Chomsky has no way of weighing the dangers of leaving Saddam in power, based on his own logic, how can he demand the administration does not act? Respectfully, this is nonsense. I lived in the USSR for 30 years and know for sure: there are evil regimes that must be disarmed. Chomsky has it in a nutshell. There are so very few scenarios in which violence let alone war, can be justified. To date, none of the arguments hold water. Empty dossiers, unsubstantiated accusations - at what point will we start to question the validity of the "intelligence" we are being fed? Isn't it time that the people in the UK and America realised that their opinion is no longer of any interest to their respective governments. They will do as they see fit for their own resons while spinning a diversionary and deceptive web to try and bolster the public to their cause. This has nothing to do with the welfare of the population of the UK and US it is entirely to do with corporate greed and control. It's time for a change. Chomsky is right in that he says violence is not tolerated by the masses any more and the governments seem to be ignoring this fact. This war would (will?) make the world a much more dangerous place than it already is. I agree with Noam Chomsky competely: the current arguments for having a war between the US and Iraq are in no way justified by the results. Yes, the oppressive dictatorship in Iraq should end, but using the threat of violence and force to conquer hate is insane. I fear there will be many innocent lives lost in the years to come if Bush continues his policy of tough talk with not much thought. It is clear that Noam Chomsky speaks logically; how can they think of using military action when there has been no proof of Hussein's "weapons of mass destruction"? If they are found then why does war have to take place? I cannot see why the death of thousands of people will ever solve the world's conflicts. Only through understanding and agreement through words can I see the doorway to peace.